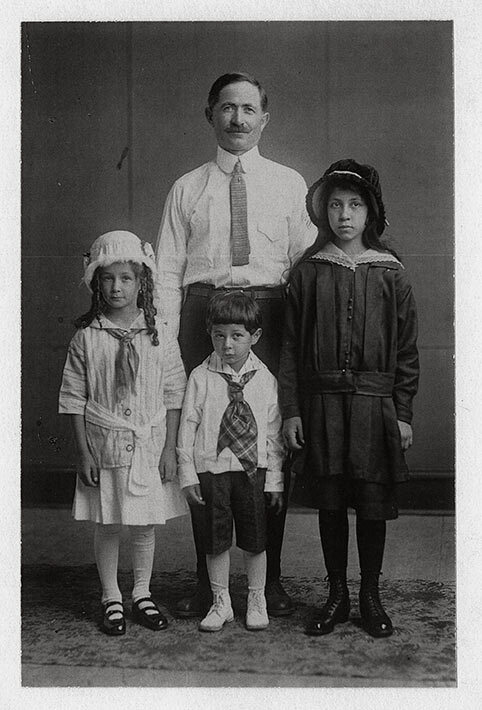 Portrait of Leopoldo (Leo) Mascioli with children, Maria, Loretta, and Daniel. This is a black and white portrait of Leopoldo (Leo) Mascioli and his children, Maria, Loretta, and Daniel. Leo is wearing a white long sleeve collared shirt and patterned tie. He has on black pants and black shoes. His hair is combed and parted neatly to the right. He is smiling at the camera. He has a mustache. To his left is his eldest daughter, Loretta. She is wearing a black petticoat with buttons and a white collar lace trim. She is wearing a black hat with a white trim, black stockings, and black ankle boots. Loretta's face is expressionless. Her little brother, Daniel, is standing to her right. He is wearing a similar outfit to his dad, except his tie is replaced by a plaid scarf that is tied around his collar. His black shorts reveal white stockings and ankle boots. The third child, Maria, is standing to the right of Daniel. She is wearing a white cloche hat. Her hair is styled in tight spiral curls. She has a white three quarter-length sleeve jacket that is belted at the waist and has big buttons at front. She is wearing either a white skirt or dress, with white stockings and black Mary Jane shoes. A coloured scarf is tied around her collar. The family is standing on a carpet strip that has a paisely pattern.